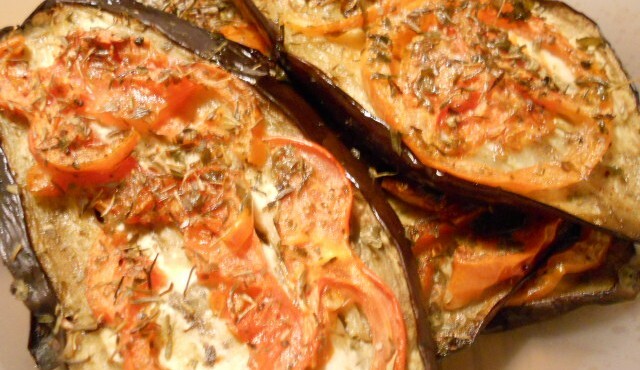 Cut the eggplant into slices 2 cm high. And arrange them in a baking pan with nonstick paper. Cut the tomatoes into thin slices and place the tomatoes on top. Sprinkle with finely chopped herbs, salt and pepper, and drizzle with oil. Bake at 200 ° for 20 minutes, until the tomatoes are dried. 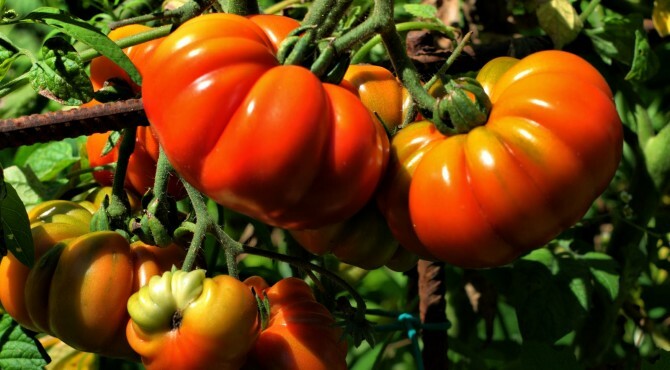 Wash tomatoes and cut into thick slices about 3 cm. place the slices in a baking pan with a bit of oil, and sprinkle with bread crumbs (just need to keep the liquid of which this type of tomato is generous). Cut all the herbs with the garlic. Put the chopped herbs over the tomatoes and sprinkle with salt and pepper. Bake at 180 degrees for 40 minutes. 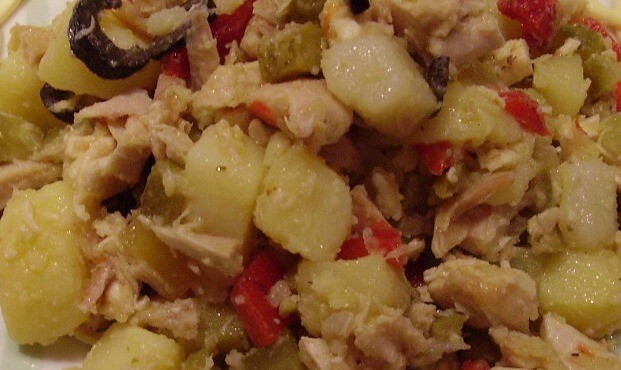 Boil the chicken in water (flavored with 1 potato, 1 zucchini, 1 onion, celery, 1 tomato …. you will have the broth as well!) for 40 minutes. When cooked take out the bones and cut the flesh into small pieces. In a bowl put the chopped tomatoes and season with olive oil, salt and pepper, and add the chicken pieces. Boil the potatoes and when cooked cut them into cubes and add to chicken. Now add the finely chopped parsley and basil, black olives, cucumbers cut into slices, a pinch of oregano and plenty of oil. Keep in refrigerator until ready to serve. 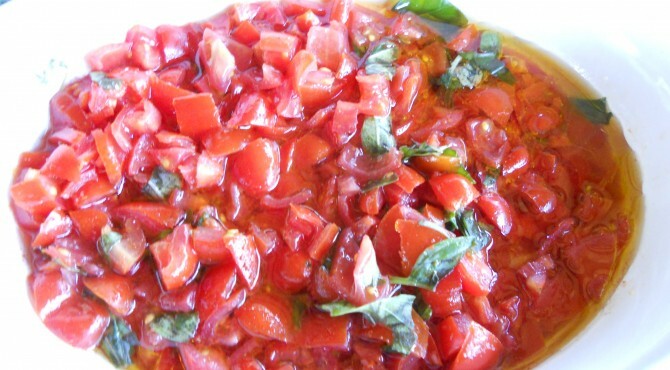 Cut the tomatoes into small pieces and place in a bowl with the capers, basil, thinly sliced clove of garlic, oregano. Season with salt, pepper and olive oil. Cut the zucchini in half lengthwise, and remove the pulp. 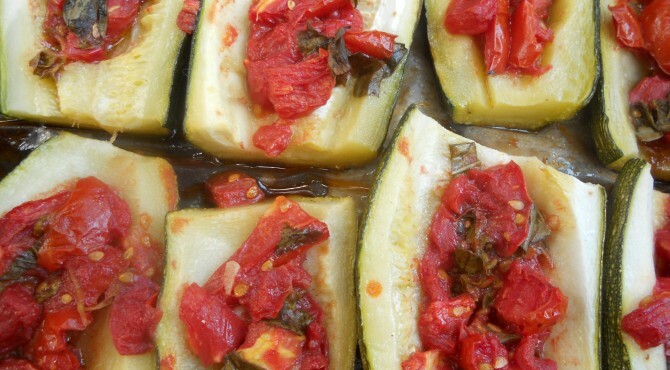 Place in a baking pan with oil, and fill each zucchini with seasoned tomatoes. 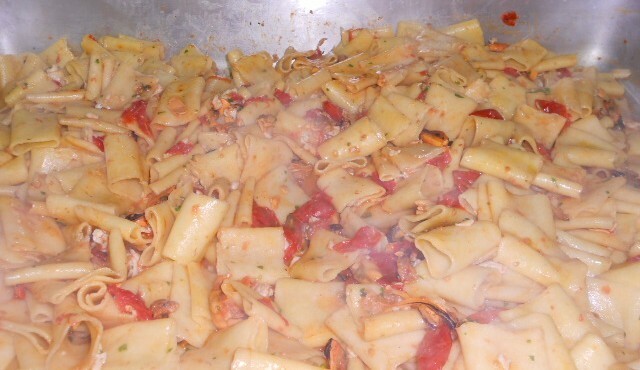 Put the white wine and two glasses of water, cover with aluminum foil and bake in oven at 200 degrees for 40 minutes. After this time remove the aluminum and continue cooking for 20 minutes. Serve warm. Mix the minced meat with a slice of bread soaked in water, add the egg, Parmigiano, a pinch of salt, and a pinch of nutmeg. Work it very well and let it rest in refrigerator for half an hour. Half an hour later, lay the meat on a sheet of wax paper (should be about 3 cm.) put another sheet of paper on it. Roll it with a rolling pin (or a bottle) to compact the mixture. When ready put it in the fridge for another half hour. In the meanwhile, cut the courgettes into sticks (by removing the inner pulp) and cook them in a pan with the finely chopped onion and two spoons of olive oil. 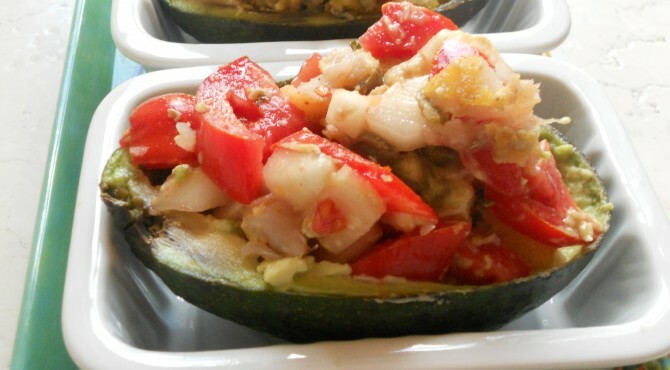 Cook it for 15 minutes, stirring constantly: the courgettes should result crunchy. Now add the basil leaves, salt and pepper. Put the tomatoes in a baking pan with a little ‘oil, a pinch of salt, a teaspoon of sugar, plenty of oregano and bake at 200 degrees for about 1 hour. 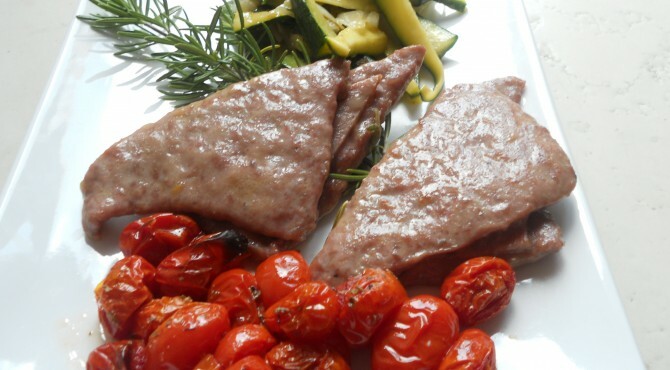 It ‘s time to remove the meat from the refrigerator: with a knife cut them into squares and create a sandwich stuffed with a slice of cooked ham and a slice of scamorza. When ready cut again in half (triangles are more convenient for cooking!). Let them cook in a pan with olive oil, rosemary and sage, on low heat for 15 minutes. 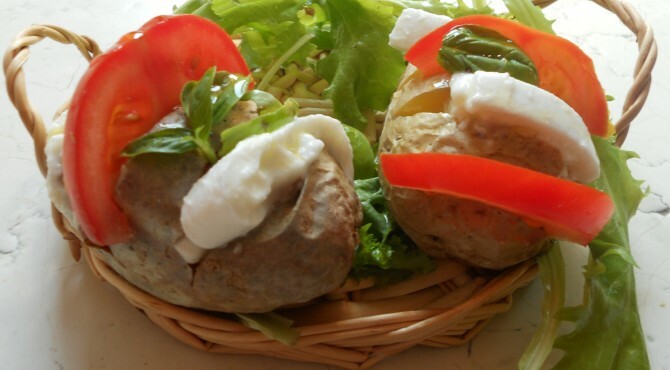 Serve the stuffed veal with courgettes and cherry tomatoes.